This meatball lasagna recipe is an excellent meal that is lower in fat and calories than other lasagnas. Preheat oven to 425. Line a baking sheet with foil. Place peppers, cut side down, on sheet. Roast for 20 minutes or until charred. Wrap in foil for 20 minutes. Use a sharp knife to peel skins and slice. Reduce oven temperature to 375. Meanwhile, cook lasagna noodles according to package directions. Drain noodles; rinse with cold water. Drain; set aside. For filling, in a small bowl, stir together ricotta cheese, 1 cup of the mozzarella cheese, and the goat cheese; set aside. 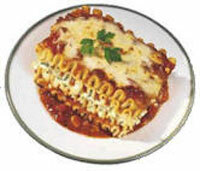 To assemble, spread 1/2 cup of the pasta sauce in the bottom of a 2-quart rectangular baking dish. Layer two of the cooked noodles in the dish. Arrange meatballs on top of noodles in dish. Add 2 more noodles . Top with ricotta mixture. Arrange green pepper over cheese layer. Top with remaining noodles. Spread sauce over noodles. Bake, covered, for 50 minutes. Uncover and sprinkle with remaining mozzarella cheese. Bake, uncovered for 5 to 10 minutes more. Let stand for 15 minutes before serving. Preheat oven to 350. In a large bowl, combine the remaining roasted red peppers, the bread crumbs, egg product, tomato sauce, basil, parsley, salt and pepper. Add ground beef; mix well. Shape meat mixture into 48 meatballs. Place meatballs in a foil-lined 15x10x1 inch baking pan. Bake about 20 minutes until done at 160 F.
Tip You can store the meatballs ahead of time in an airtight container for up to 3 days in the fridge.